The current Ukrainian authorities have no other way to resolve the crisis in the eastern regions but to negotiate with the rebels, former President Viktor Yanukovich says one year after the climax of the Maidan protests in Kiev saw him leave the country. "Stop the war, stop insulting the inhabitants of the southeast, remove these labels from people. Give guarantees that self-administration would be sufficient for these regions to protect their rights. And this process should by all means involve European countries and Russia," he said in an interview with the Russia-1 TV channel. According to Yanukovich, there's a lot of "accumulated resentment, mistrust and hatred today among those people whose families have suffered." "Many people have died, a lot of people have been humiliated. It takes time to reach a level of trust that will allow us to live together. Therefore, a transition is needed. 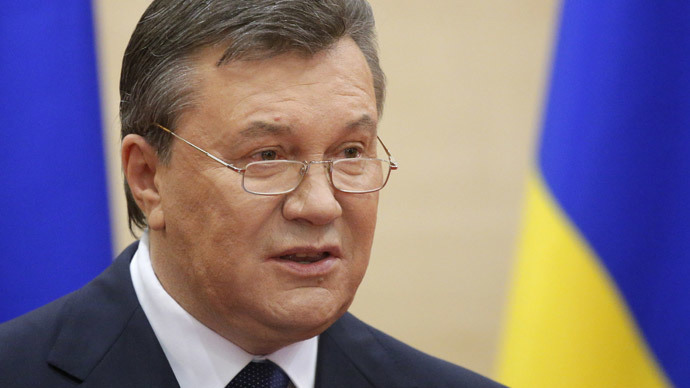 And we need to go step by step along the way of building trust," Yanukovich wrapped up. Yanukovich believes Western countries, which a year ago acted as guarantors of the agreement between the current government and opposition, must take responsibility for what happened in Ukraine afterwards. "Obligations have been taken by two sides - the power and the opposition, while the guarantors were the three foreign ministers of the three major European countries. I agreed to early presidential elections, constitutional reform and to hold elections to the parliament and presidential elections on a new basis. What else was needed? [They] had to carry out everything and then wait for the decision of the Ukrainian people," he also said, in a TV interview on Saturday. Yanukovich, who has been living in Russia since last February, said he made all these concessions to avoid bloodshed. He is on Interpol’s wanted list, accused by the new Ukrainian government of embezzlement and financial wrongdoing. "The very arrival of the three ministers in Kiev was a milestone. Representatives of the three largest European countries had arrived [the foreign ministers of Poland, Germany and France] and, together with the president, the current government and opposition, they prepared an agreement. What is this? Involvement? Complicity? In what capacity did they come? After all, they have initiated the process, so they should bear the responsibility," Viktor Yanukovich said. Subsequent events, according to the ex-president of Ukraine, occurred due to the fact that the new authorities "were afraid that people would react very negatively to their actions, and they wouldn't be elected." "So the war was unleashed to exclude people from this political process. And partly they've succeeded in doing so. After all, southeastern Ukraine did not actually take part in the elections. And if it did participate, then only a small part of the population," Yanukovich added. Last February, central Kiev saw several days of bloody clashes between rioters and the police at the ‘EuroMaidan’ rallies, where approximately 100 people were killed on a single day – February 20, 2014. Yanukovich remarked on Saturday that the Ukrainian authorities condemned those allegedly responsible for the deaths of people on Independence Square in February last year "without charge or trial." "They announced [guilty] law enforcement and the president. In my opinion, this is a classic scenario of the color revolution," he said, adding that at the time when he was in power, law enforcement agencies "practically had proof that these murders had not occurred in those places and that corpses had been planted." Events on Maidan compelled Yanukovich to flee the country while the opposition formed a new government. In April, the new Kiev authorities started an anti-terrorist operation against breakaway regions in eastern Ukraine, who didn’t recognize the coup-imposed authorities in Ukraine. According to the latest UN estimates, the resulting civil war has claimed the lives of at least 5,600 people.